Culinary Arts field trip to Biscuits & Co.
Maine Education Commissioner Pender Makin visits OOBHS! The OOBHS combo with world renowned trumpet player Thomas Gansch of the Mnozil Brass from Austria! Spanish students visit Orono to observe Spanish classes at the University of Maine. Check out this video to see what we are all about! OOBHS Outing Club is Awarded 2018 Teens to Trails Grant! Old Orchard Beach High School is a four-year public high school that serves approximately 250 students in grades 9-12 with a comprehensive academic and extracurricular program. Come join our community today! Old Orchard Beach High School is a ½ mile from beautiful beaches and a vibrant downtown community. 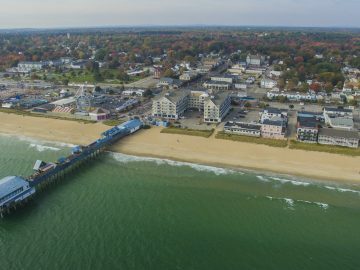 Old Orchard Beach is a great place to work, live, and learn. Come visit us today! Old Orchard Beach High School offers low student-to-faculty ratios enabling us to deliver individualized instruction to optimize learning for all! 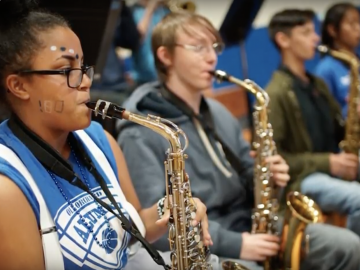 OOB High is small but mighty -- whether you're passionate about academics, sports, or student life -- our diverse academic and extracurricular programs provide ample opportunities for all students.